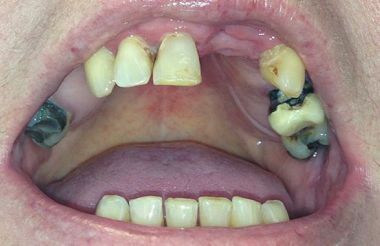 This middle-aged patient had received numerous dental treatment: bridges, crowns, root canal treatment, posts, etc. She couldn't wear dentures and could only chew with her front teeth. She had raised four children and had no problems with her teeth until she reached 40. Her lower molar teeth became loose and were extracted and she got dentures that she couldn't wear. She could only chew with her front teeth, which also became loose and so she needed more and more treatment in the years that followed. Severe inflammation around the upper teeth made it impossible for the dentist to save them and so they were all extracted (12) and replaced with 10 BCS implants and a 12-unit bridge. She also received 2-2 KOS implants and 3-3-unit bridges on both sides of her lower jaw to increase chewing ability and reduce pressure on the front teeth. The whole treatment took 5 days and the patient stayed an additional 2 days to have her beautiful new teeth checked. It is extremely important to maintain a high calcium intake following lactation in order to have healthy bones and teeth; a severe lack of calcium causes the same problem for many female patients of about the same age. In many cases, severe bone loss makes it impossible for implantologists to help these patients using conventional implant systems. However, in most cases our specialists can help these patients by replacing their missing teeth with a cuttiing edge 5 day implant system. Do you need similar solution? Why might you need implants? Find out more about it! Why is the implantologist's expertise important? 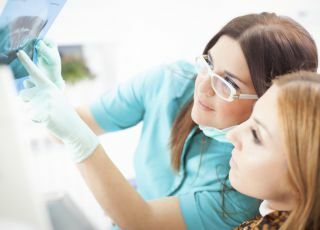 Unfortunately, an implant treatment carried out improperly can cause several problems: inflammation, bone and gum recession and in the end it might result in the loss of implant. Over the last ten years our partner dentists, implant specialists have treated thousands of satisfied patients. The implant success rate is approx. 98%, providing patients with asecure and permanent solution to their specific dental problem. Get to know our implantologists!